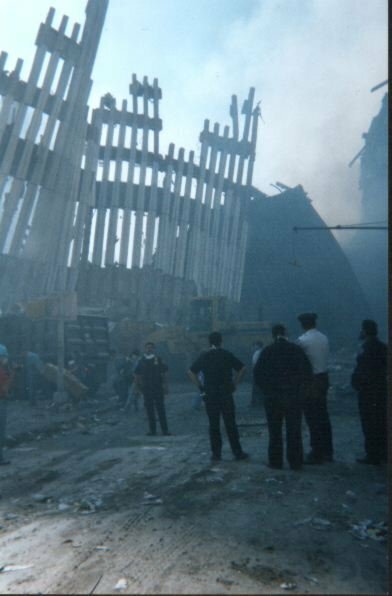 enormous loss of life at the World Trade Center is overwhelming. Words cannot adequately describe any of this. We have also witnessed countless incredible acts of valor and selflessness. From the first terrible moments our citizens have conducted themselves in a manner that can only be described as magnificent. Cops, firemen, medics, doctors, nurses, construction, transportation and sanitation workers, engineers, merchants, civilian volunteers and National Guardsmen have come together as one to rescue those still alive and to care for the injured. These were not only New Yorkers - before the first day was over, many had come from New Jersey, Pennsylvania and Connecticut to help in any way that they could – and they're still coming. In a horrific and totally unprecedented situation where panic and confusion would be expected, total strangers have worked together as if they did this all the time. Where despair would be understandable, we have had hope. The evil of this attack has been more than equally matched by the good of our people. Thank you all for your support and love. Stand tall and be proud to be an American. Our enemies truly have no idea just who we are. Bob Cohen is the commander of the North Manhattan district for the New York City Police Department. This letter was sent to friends soon after the WTC attack. In the photo above he is the one in the white shirt. His in-depth article on the subject will appear in the October issue of Penthouse.